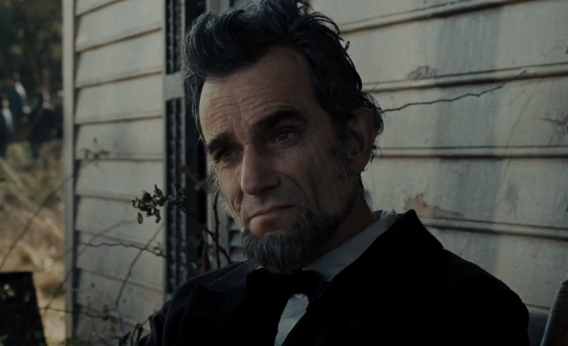 Lincoln trailer: Daniel Day-Lewis plays Abraham Lincoln in the new Oscar-baiting film from Steven Spielberg and Tony Kushner. Danile Day-Lewis plays Abraham Lincoln in Lincoln. Still from the trailer © Dreamworks 2012. Four score and seven years ago, our forefathers began developing a new movie about President Abraham Lincoln. Or at least it seems that long ago. Now tonight, after multiple scripts, multiple Abes, and more than a decade in development, Steven Spielberg’s Lincoln has finally brought forth a new trailer, revealed in a very awkward Google Hangout ridden with technical difficulties this evening. So how does the stovepipe hat of Honest Abe fit the man who played Daniel Plainview? The most striking aspect of Day-Lewis’ presence is not his convincing visage but his voice. Rather than the booming growl he developed for his acclaimed roles in Gangs of New York and There Will Be Blood, Day-Lewis’s voice is high, folksy, at times almost meek. In the Google Hangout that premiered the trailer, Spielberg said of the former president, “We treat him as a man, not a monument.” But if true, that doesn’t quite come across here. Still, given that the screenplay is by Tony Kushner, the man who won a Pulitzer Prize for the immensely ambitious Angels in America, I’ll give Spielberg the benefit of the doubt until I see the final movie. In the meantime, all we see for the first minute is Lincoln posed and still. What follows looks less like Spielberg and Kushner’s politically charged and fairly ambivalent Munich, and more like Spielberg’s other slavery drama, Amistad. It’s all handsome production design and funny beards. If you can take your eyes away from the beards, that production design might be the real star, with one of the fullest realizations of the Civil War era yet. We do eventually see Day-Lewis break through, in the final seconds, and it’s thrilling—until Spielberg’s spit-shined and serifed old-fashioned font returns. Filling out Lincoln’s Team of Rivals—the movie was based in part on Doris Kearns Goodwin’s biography—is a cast of Oscar-winners. Sally Field plays Mary Todd Lincoln, Tommy Lee Jones plays Thaddeus Stevens, Joseph Gordon-Levitt plays Lincoln’s eldest son Robert Todd Lincoln, David Strathairn of Sneakers fame plays William Seward, John Hawkes plays Colonel Robert Latham, and Hal Holbrook plays journalist Francis Preston Blair. Mad Men fans may also spot Jared Harris (Lane Pryce), who will fill the more formidable shoes of Ulysses S. Grant (though he looks more like Bryan Cranston), and Girls fans will be thrilled to spot the unlikely presence of Adam Driver. To see whether Day-Lewis can break out of his marble mold, win Oscar voters, and maybe even save this movie, we’ll have to wait until November 9th.